How to make your business information dearer to customer without annoying them? Hand them these promotional 3.5x9 inches year at a glance business card calendar magnet – 25 MIL. This calendar comes of great use as a date reference and it becomes a feisty refrigerator art, too. This theme suits businesses of all types and they can avail it at discounted prices by ordering it bulk. 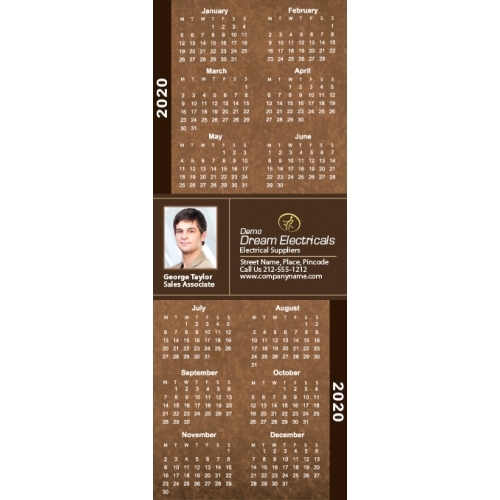 This calendar magnet is produced using high quality resourced material and is offered with laminated finish, which accords perfection to information imprinted on the magnet. Request a quote to know price benefits on wholesale customized 3.5x 6 inch year at glance business card calendar magnets – 25 MIL. Imprint Method- Full-Color (Four Color Process) & Pantone Color Match. Price includes printing in full-color (four color process) on one side. Exact color matches, metallic and fluorescent colors not available in full-color. Magnets are not intended for outdoor use. Write-on/Wipe-off surface not available. Product Size : 3.5 in. x 9 in.